Sleeping eight people in four bedrooms, this bungalow is in a country location in Martletwy, a scattered village 7 miles from Narberth. 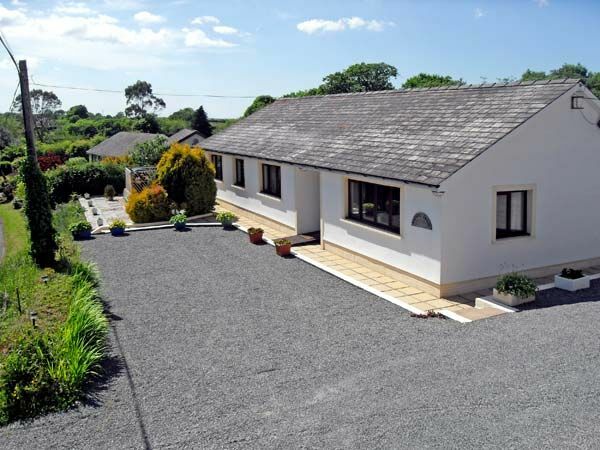 Badgers Brook is a bungalow in a rural setting 7 miles from Narberth. The cottage has two double rooms, a twin room and adult bunks. There is a family bathroom and a shower room, a kitchen and sitting room with electric fire and dining area. Outside, there is ample off road parking, a rear decked and lawned garden, and shared use of a paddock over the road, with childrens' play items. Badgers Brook is a comfy family base for enjoying Pembrokeshire's castles, beaches, walking and more. Amenities: Storage heaters and radiators with electric fire in sitting room. Range with electric oven and hob, microwave, fridge/freezer, washing machine, dishwasher, TV with Freeview, DVD, CD/radio, WiFi, small selection of books, games and DVDs. Fuel and power inc. in rent. Bed linen and towels inc. in rent. Travel cot and highchair on request. Off road parking for 4 cars. Secure bike storage. Private patio to rear with garden furniture and BBQ. Shared use of large grassed paddock with children's play items, used at own risk. One well-behaved dog welcome. Sorry, no smoking. Shop 3.5 miles, pub 2.5 miles. Note: There is a fenced stream in the paddock. Town: With its abundance of quirky shops, tea-rooms and restaurants, the bustling town of Narberth is a wonderful place for a daytrip, and with many pubs as well as live bands playing at the Queens' Hall it makes a great place for a night out too. The rest of Pembrokeshire is within easy reach, with the seaside resorts of Tenby and Saundersfoot particularly close by, as are the isolated, unspoiled sandy beaches at Broad Haven and Barafundle. Boat trips are available locally and offer visitors the chance to spot dolphins in their natural habitat, whilst the island of Skomer is home to a huge variety of bird life. For those who crave something more of an adrenaline rush, the Oakwood Theme Park is close by and the area is home to numerous white water rafting opportunities. All ground floor. Four bedrooms: 2 x double, 1 x twin (1 x 3' bed and 1 x 2'6 bed), 1 x adult bunks. Bathroom with bath, basin and WC. Shower room with shower, basin and WC. Fitted kitchen. Sitting room with dining area and electric fire. Storage heaters and radiators with electric fire in sitting room. Range with electric oven and hob, microwave, fridge/freezer, washing machine, dishwasher, TV with Freeview, DVD, CD/radio, WiFi, small selection of books, games and DVDs. Fuel and power inc. in rent. Bed linen and towels inc. in rent. Travel cot and highchair on request. Off road parking for 4 cars. Secure bike storage. Private patio to rear with garden furniture and BBQ. Shared use of large grassed paddock with children's play items, used at own risk. One well-behaved dog welcome. Sorry, no smoking. Shop 3.5 miles, pub 2.5 miles. Note: There is a fenced stream in the paddock.